8 to Glory sounds like it could be anything, but is, as a matter of fact, one of the few bull riding games available on this planet. The 8 stands for the number of seconds you need to stay on the bull before you are victorious. Eight seconds don’t seem that long but ask any professional bull rider, and it’s actually an impressive amount of time to sit on the back of a bucking, ferocious beast. 8 to Glory is one of those games that doesn’t give you a story but instead lets you get on with it by playing a career mode that allows you to make up the story in your own mind. This also means there is literally zero narrative except from following a line throughout the country to conquer bull riding everywhere. It does, however, include a couple of real-life riders with their biography included. 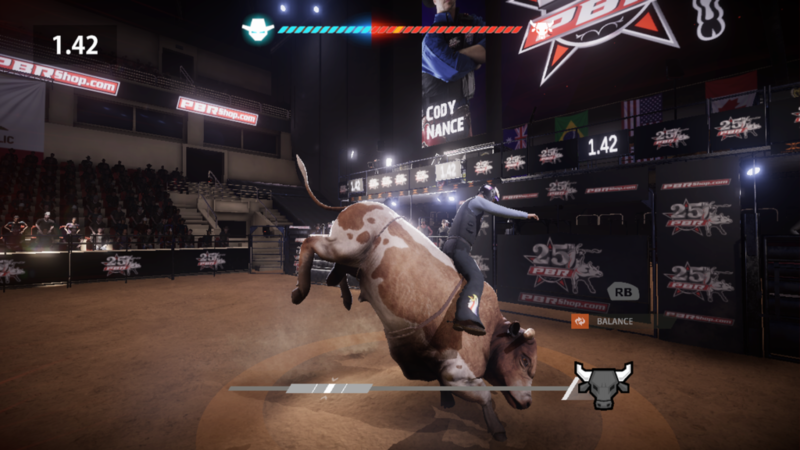 It’s a piece of fan service that’s already nice since there aren’t many bull riding games to go about, and this will give you a piece of what the professional bull riding world actually has to offer. The graphics are alright when just looking at the textures, though it’s nothing great at all. 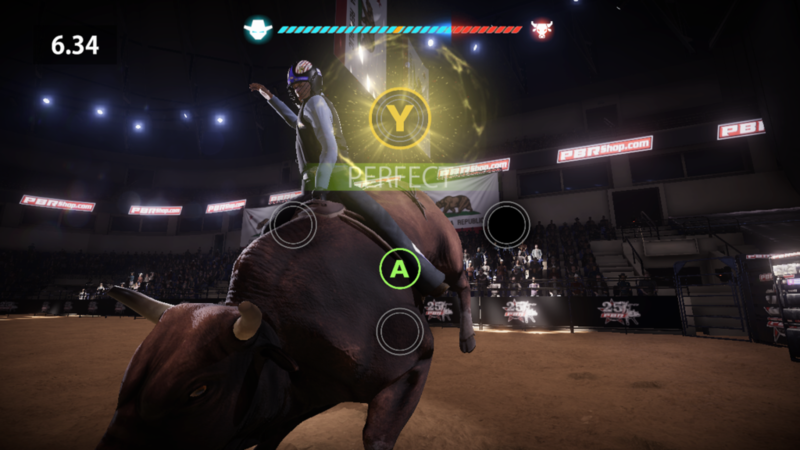 There are some clumsy looking animations where real-life situations are mimicked by letting the rider quickly jump over the fence after he completed a ride or by letting the bull headbutt him in his back. It’s definitely not animated very vivid or coherent, and even though it’s nice to look at a bull jump into the air in slow-motion, the creature and its rider still often look like plastic toys, where the appearance and eyes are lifeless. The sound in 8 to Glory is about the best the game has to offer. The audience sounds nice, the commentators rather professional, and in the menu and during the game there are some nice fitting background tracks with some country and rock blends that give a bit of a cowboy vibe. What’s weird though is that you don’t hear any sounds from the riders or the bull ever. It’s like they didn’t even think about putting anything like it in the game. 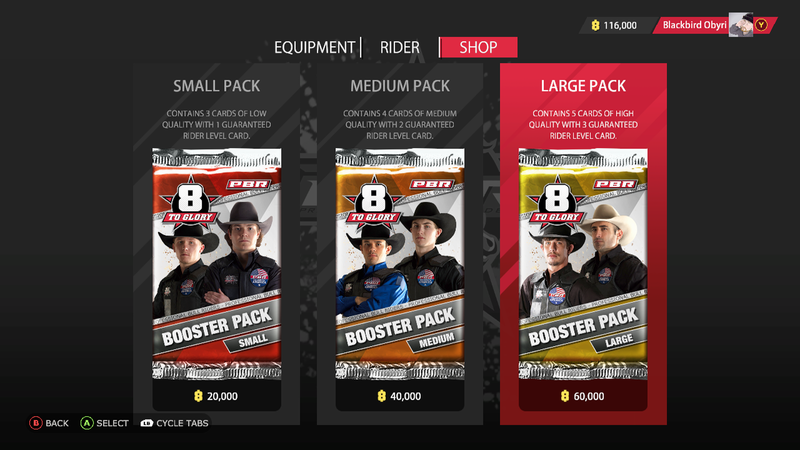 8 to Glory is, as you guessed by now, a bull riding simulator. 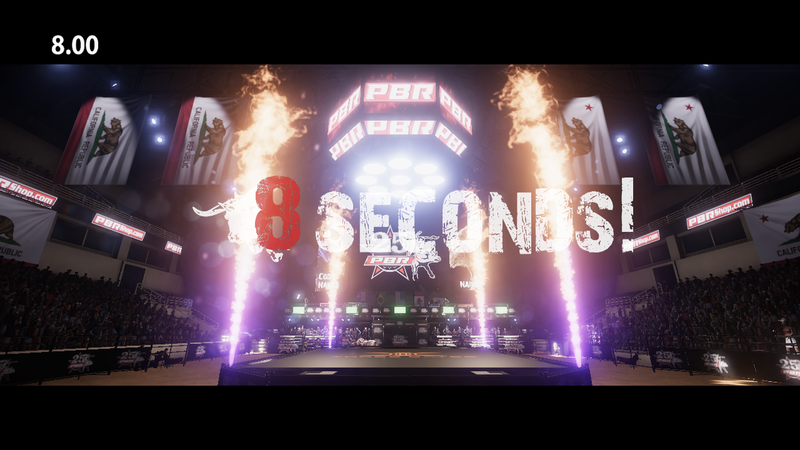 You could fit it somewhere between the SSX and FIFA games or the NBA and NFL, and 8 to Glory is even officially branded as ”the official PBR game” (Professional Bull Riders). It’s hard to compete with other bull riding games since there barely is any out there, yet looking at formerly named game series such as SSX, there’s a good idea what you could expect from any game that’s supposedly sports-related. The game lets you choose between following a career, doing some arcade play or a multiplayer experience with your couch buddy. It doesn’t really matter what you choose, the principle will be the same. You will be presented with three mini-games that you will repeat forever. All three are based on the same principles of timing. First, you need to decide how much grip you got on the bull by trying to hit a moving bar as close to the center as possible, then you need to time rings that close in with the marked area, and then you do a guitar hero type of game using your four buttons. If you hold on for a total of 8 seconds, you did a successful ride. There, the entire game has been explained and spoiled, and it was easier than explaining Flappy Bird. You can swap between riders but it won’t really matter. You can open earned or bought card packs that include items to boost your stats such as balance, presumably making the game slightly easier. You won’t really feel this difference either. It keeps boiling down to three basic mini-games that should never have left a (free!) version on the phone. On top of that, one or two of these mini-games have been designed better in other games as well. It’s understandable if you like bull riding, and new or little-represented genres should be cheered upon. But anybody who ever plays any games can see this is not the way you create something worthwhile. Especially for a mobile game that has the audacity to ask a whopping $30/€30 on a more powerful gaming platform, it’s very hard to take any review that awards this game a good grade seriously. 8 to Glory had some small amount of content in there that could have been worth your while, was it not thwarted by the abomination of three rather poorly designed mini-games that make up everything you can play. The truth is this theme could be replaced with basically any mundane task involving the same mini-games and it would “fit” those themes as well. Like cutting bananas in equal pieces or throwing the right amount of trick and treat candy in a bag each time the doorbell rings. Would you pay 30 bucks for that?